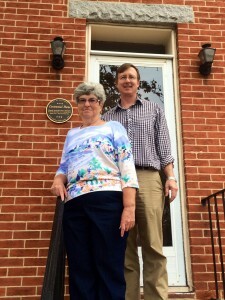 Ms. Jane Buccheri in front of her Centennial Home at 840 W. Pratt St. with Baltimore Heritage Director Johns Hopkins. Jane Adele Buccheri is the first Centennial Homes Family homeowner in the Hollins Market Neighborhood of Baltimore, at 840 W. Pratt Street. Her maternal grandfather and his first wife purchased the house on October 2, 1891. Walter J. O’Creane from County Wexford, Ireland and his first wife, Mary, from County Wicklow, Ireland came to the U.S. with four children, all born in Ireland. To avoid discrimination against being Irish, Walter changed their surnames to Crane upon their immigration. Once in Baltimore, he found work at the B&O Railroad as a tool & dies maker. Walter later left the B&O Railroad to become an independent contractor, tool & dies maker. Their youngest, a daughter, died as a child and shortly after Mary Crane also died, leaving Walter with three boys to rear on his own. Walter returned to Ireland to find a second wife, Mary Jane Boyce, Jane Buccheri’s grandmother. They raised the three children from Walter’s first marriage, along with five additional children they had at 840 W. Pratt Street. Mary Jane Crane lived at 840 W. Pratt St. until her death in 1958. For twenty years from 1958-1978 the house was passed to her two oldest children and then to their oldest niece while the property was rented. In 1978, Marianna Freeman, Jane’s sister passed the house to Jane who is the present owner. The house has remained in the ownership of a family member for the last 120 years and family members have occupied the property for 100 of those years. Jane’s paternal grandfather, Nicholas Bucheri, from Sicily, Italy also experienced a similar situation to that of Walter Crane in that he lost his first wife and was left with four children to raise alone. His second wife, Marianna, Jane’s grandmother, also from Italy settled with him in Baltimore to grow a larger family. The youngest daughter of Walter Crane, Elizabeth Bridgette, married Sylvester James Buccheri on Nov. 14, 1939. The young Buccheri couple moved to Irvington, MD and had four children, two boys and two girls, the youngest girl, Jane Adele Buccheri. Sylvester and Elizabeth moved the family to Glen Burnie in 1952 and remained there until they died. Jane Buccheri began working for the National Security Agency right after high school. She attended college at Catonsville Community College where she received an AA degree. She worked at NSA for 33 years and retired in 2000, but has continued actively volunteering for her church, the former St. Martin’s Parish which today is The Transfiguration Catholic Community Church. Jane also has been involved in many other community organizations. She has been the President of Hollins Roundhouse Neighborhood Association from 2008 to present, a member of COIL – Communities Organized to Improve Life, a Community Action Board member of CEASE – Communities Engaged and Advocating for a Smoke Free Environment and a member of Southwest Cares Board, dealing with the health disparities of Southwest Baltimore’s lower life expectancy. Some of the things Jane likes best about her neighborhood are the art festivals, the New Beginnings Barber Shop art shows and the Black Cherry Puppet Theatre. The close proximity to downtown Baltimore and the convenience of getting to the city without having to drive through it is one thing she enjoys. The easy access to highways from her house was another benefit she appreciated when she traveled to her work for 33 years.